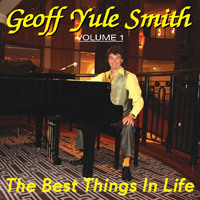 Geoff Yule Smith VOLUME 1, The Best Things In Life - Geoff’s exciting debut Album CD. 13 great pop-rock songs and instrumentals. Listen to it, dance to it. Hear the versatility of this fast-emerging super-talent ! * When clicking on these iTunes buy-now buttons there may be a brief delay while the iTunes buy page opens. If iTunes does not open on your computer you may need to download the iTunes music store at www.itunes.com.au or choose one of the other BUY NOW buttons here. 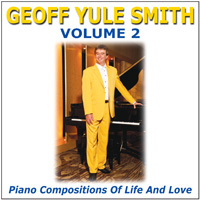 Geoff Yule Smith VOLUME 2, Piano Compositions Of Life And Love - 14 new light-classical compositions by Geoff Yule Smith performed solo at the grand piano. This Album is a wonderful new musical revelation of Geoff's inspiring music and performances. A great new addition to your collection ! If iTunes buy page does not open on your computer, please see * the note above. Quoting catalogue numbers, as above. or: Extraordinary Entertainment, Sydney, Australia. 1.1. These are the direct licensing guidelines of EXTRAORDINARY ENTERTAINMENT. At present we do not directly license any of our sound recordings or music videos. This position will be reviewed every 12 months. 1.2. In the meantime, if you require a license for public performance or transmission of one of Geoff Yule Smith’s sound recordings or music videos you should contact the Phonographic Performance Company of Australia (PPCA) at www.ppca.com.au or call (02) 8569 1111.